The best Yoga mats For Outdoor Adventure – All kind of adventure related products support ! Yoga is one of the most popular and effective practices that is practiced all over the world for overall wellbeing. All those who have practiced yoga are aware of its difference from all other forms of physical activities and hence the use of a yoga mat is very essential. The postures and poses of Yoga are difficult to do on the ground or a hard surface, so the cushioning effect of the mat gives the right balance to your practices. In the current market, there are a wide variety of mats available, built with various materials and fit for various forms of yoga. Choosing the right mat for your yoga practices can be quite a task but there are some basic features that you need to note. You can always choose the style and color of your preference but you need to make sure that the mat offers the right mixture of comfort and stability. It should also be portable so that you will have no problem in carrying it around. The type of cushioning you need, depending on your body and the nature of your practices is also an important factor to consider. So before you are off to buy a mat, you can take a look at the few guidelines that are noted below. There is no yoga mat that will be fit for everyone as many factors are involved in making a yoga mat an ideal one. The thickness of the mat that you will choose a very important factor as the amount of cushioning depends on the thickness. Thin mats do not provide adequate cushioning for your legs or hips and if the mat is too thick, you might lose a stable connection with the ground. Travel yoga mats are thinner while some premium mats are an even ¼ inch in thickness. In general, mats which are 1/8 inch in thickness are ideal for most users. The material of the mat will determine its cushioning property, the amount of friction it provides with the ground and also its longevity. Mats are made out of a variety of materials like foam, PVC, cotton or rubber. Jute and organic cotton are very good natural options but they might not offer the best cushioning. TPE and foam mats are good in cushioning and they also last for a long time making them a good option. Unless you are allergic to rubber it is a very good choice as it is the most slip resistant substance. In case you have sensitive joints, you might want to choose a thicker mat to get some more cushioning. Also if you are a tall person, a standard mat might fall short for you and it is best you choose a bigger one. Also, remember that thicker mats will be heavier to carry around. The texture determines the traction that the mat provides while you are practicing yoga on it. A rougher or patterned texture offers more resistance to slippage and it also determines the overall feel of the mat. Natural fibers like jute have a rougher feel whereas PVC materials are softer. You can also choose the modern eco-friendly mats which offer softness as well as stickiness. The thicker mats with eco-friendly materials are placed at the higher end of the price range. If you want a more colorful mat with patterns or prints you will have to pay more but since you will be using it frequently you can very well go for it. I will also put up a small chart with the basic features of the Yoga mats that we review so that it can be easy to compare them. 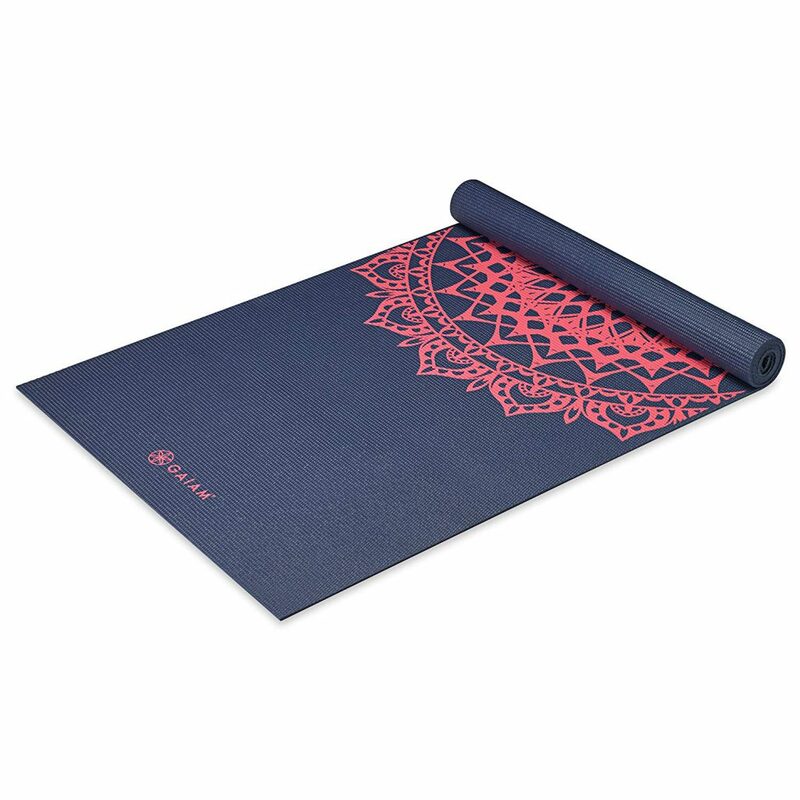 This mat is a great piece for all yoga practitioners as it provides style and comfort in an eco-friendly package. This mat provides a great looking product which is lightweight but very durable. The PVC material is non-toxic and provides sufficient cushioning. It is also of the right dimensions so no matter which poses you practice you will always be on a comfortable surface. The PVC material used for the mat is non-toxic and it is free from six of the harmful Phthalates. The thickness and texture are perfect to provide the perfect base for your yoga poses. It is also very comfortable for your joints and provides the right balance. This is a very important factor as you do not want the mat to slip when you are holding a yoga pose. This mat has an anti-skid texture which gives very good traction on any surface enabling you to practice comfortably. Carrying your mat to the studio is not going to be an issue as this mat is very lightweight and easy to carry. This mat is available in multiple designs of various patterns that are bright and colorful. So if you are looking for a stylish man, this is one that you can definitely try out. Dimensions: 68 X 24 inches. This is a great Yoga mat with all-around features that will help you stay in your poses very comfortably.